The Second Age: Cory Booker: Too Genuine for National Politics? 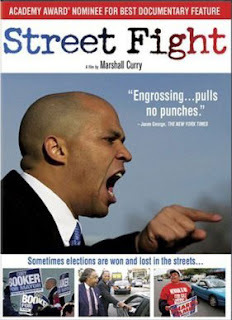 Cory Booker: Too Genuine for National Politics? If you've been paying attention to the latest political rhetoric around Bain Capital, you would know that Cory Booker had an embarrassing backtrack from comments he made on Sunday morning on Meet the Press. Booker said on that program that negative attacks coming from the Obama camp focused on Romney's work at Bain Capital were "nauseating" and comparable to the right's attacks about Jeremiah Wright. Booker wanted the Obama camp to focus on the positives of this administration's accomplishments instead of making attack ads. Booker later walked back on the comments, saying that he actually encouraged the Obama campaign to "examine his [Romney's] record" at Bain, using the justification that Romney himself has made it the centerpiece of his campaign. Romney says he's not a career politician, and since he's only been involved in two careers (political and business—namely private equity) then the only other career Romney feels he has held is business. Ipso facto, Romney is running on his record as a businessman. Now, if one wanted to really parse this out they could say that on MTP Booker was repudiating the increasingly negative tone of campaigns and the indictment of private equity as a business, as opposed to Romney's record in the field, and given Romney's denial politics as a career then the only thing to judge him on is his private equity record. But this is American politics and nuance—like common sense and logic—has no place here. And this is where Cory Booker's biggest weakness comes into play: he is a common sense man who is genuine with the public. This is the era of death panels and birthers, sluts and Nazis. And you want to bring genuineness and logic into it? Agree or disagree with Booker on MTP, it was his genuine opinion. It was clear his follow up video was not as passionate as his stint on Meet the Press. Cory Booker's mostly refreshing approach to politics reminds me of someone who ran for president in 2008. If I'm not mistaken, it's the same person today telling Booker to walk back on his true opinions.